Article and photos by Cassidy Johnson. The tour began with an exploration of the farm’s old stables and then continued to the racetrack, the new stables, and a short visit with the horses. 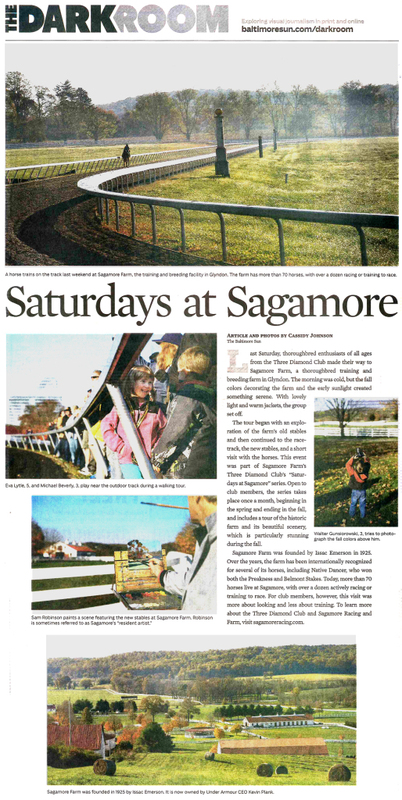 This event was part of Sagamore Farm’s Three Diamond Club’s “Saturdays at Sagamore” series. Open to club members, the series takes place once a month beginning in the spring and ending in the fall and includes a tour of the historic farm and its beautiful scenery, which is particularly stunning during the fall. Sagamore Farm was founded by Issac Emerson in 1925. Over the years, the farm has been internationally recognized for several of its horses including Native Dancer who won both the Preakness Stakes and Belmont Stakes. Today, more than 70 horses live at Sagamore with over a dozen either actively racing or training to race. For club members, however, this visit was more about looking and less about training. To learn more about the Three Diamond Club and Sagamore Racing and Farm, visit Three Diamond Club.